Since 1994, GRAVIS, an NGO based in Rajasthan, has been actively working in rural India to improve the health and working conditions of stone miners of Rajasthan and Uttarakhand. Occupational lung diseases like silicosis and tuberculosis are common and often result in premature death. IDS supported a GRAVIS project in 2016 that reached about 15 mines and 900 mine workers and their families. The goals of the intervention were to raise the awareness of silicosis and tuberculosis in mining communities and to reduce the incidence and prevalence of these diseases in mine workers. Last year, the GRAVIS approach included medical camps which gave free health check-ups, treatment, and referrals to local hospitals. In 2016, nearly 500 miners and their family members visited one of these medical camps. 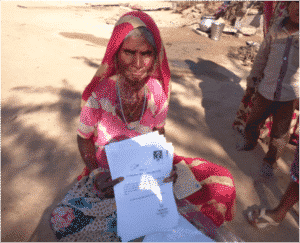 Dhalki Devi, 52, is the widow of a miner who died a few years ago of silicosis. She has five sons, three of whom currently work in mines. Over the past 17 years, Dhalki herself has worked in mines to help support her family. Dhalki came to one of the IDS-supported GRAVIS medical camps for a check-up. After being referred to a government hospital in Jodhpur, she was diagnosed with silicosis. With assistance from GRAVIS, Dhalki submitted documentation about her late husband’s diagnosis. As a family member of a patient who’d died of silicosis, Dhalki received compensation of 300,000 rupees from the Indian government; her own compensation as a silicosis sufferer is currently under review. Dhalki credits the GRAVIS medical camp with helping diagnose her condition and educating her about silicosis. Also, if it weren’t for GRAVIS, she says, she’d never have known she could apply for government compensation.